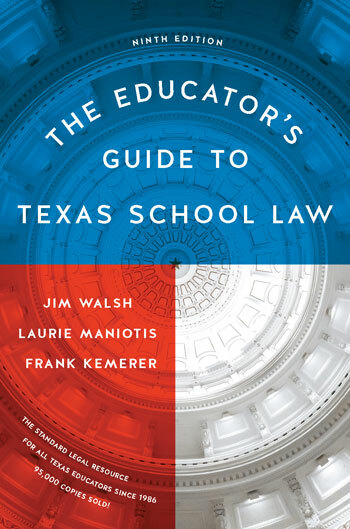 Now updated, here is the standard legal resource for Texas educators, which has sold nearly 95,000 copies. Much has changed in the area of school law since the first edition of The Educator’s Guide was published in 1986. This new ninth edition offers an authoritative source on all major dimensions of Texas school law through the 2017 legislative sessions. Intended for educators, school board members, interested attorneys, and taxpayers, the ninth edition explains what the law is and what the implications are for effective school operations. It is designed to help professional educators avoid expensive and time-consuming lawsuits by taking effective preventive action. It is an especially valuable resource for school law courses and staff development sessions. The ninth edition begins with a review of the legal structure of the Texas school system, incorporating recent innovative features such as charter schools and districts of innovation. Successive chapters address attendance, the instructional program, service to students with special needs, the rights of public school employees, the role of religion, student discipline, governmental transparency, privacy, parent rights, and the parameters of legal liability for schools and school personnel. The book includes discussion of major federal legislation, such as the Individuals with Disabilities Education Act, the Family Educational Rights and Privacy Act, Section 504 of the Rehabilitation Act of 1973, and the Every Student Succeeds Act. On the state level, the book incorporates new laws pertaining to cyberbullying and inappropriate relationships between students and employees. Key points are illustrated through case law, and a complete index of case citations is included. How Much Process Is Due? A Few Final Thoughts on "Good Cause"
Walsh is a cofounder of Walsh, Gallegos, Treviño, Russo & Kyle, P.C. ; author of the Law Dawg Ed Daily; a director of the National Council of School Attorneys, and a recipient of the Kelly Frels Lifetime Achievement Award from the School Law Section of the State Bar of Texas. Maniotis S is an attorney and the Senior Employment Investigator for the City of Fort Worth Human Relations Commission. She formerly practiced education law and served as the editor of the Texas School Administrators’ Legal Digest. Kemerer is Regents Professor-Emeritus of Education Law and Administration at the University of North Texas and founder of the Texas School Administrators’ Legal Digest.